I’m an organizing fool up in here these days! I’m so excited so many of you are with me on getting your homes + lives organized in the new year (and hopefully for years to come). We can totally do this one week at a time. 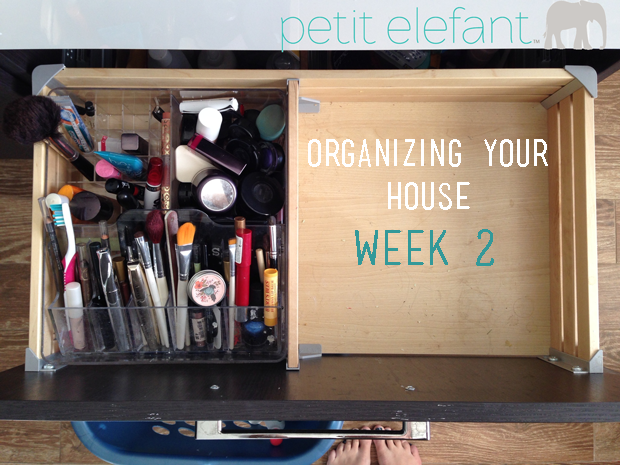 Thank you for the feedback on Organizing Your House Week One! Leave comments or email me if you’re really stressed about one area of your home / life and I’ll try to tackle it with you. Safety and strength in numbers, right? RIGHT? I can feel your enthusiasm all the way from here. I’ll be really honest with you and tell you that in the short time since we’ve remodeled our master bathroom, the vanity has become a cluttered mess. 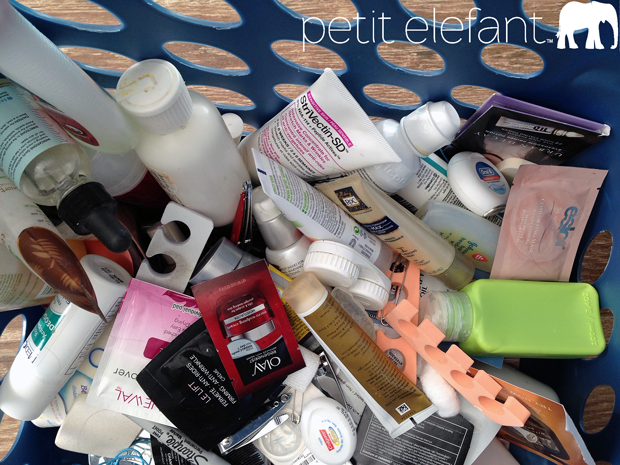 A total catch-all disaster of makeup and beauty products and random toiletries. Barf. I pulled everything out of one side (I needed to break this project up into smaller sections) and put it in a laundry basket to deal with when I had time. 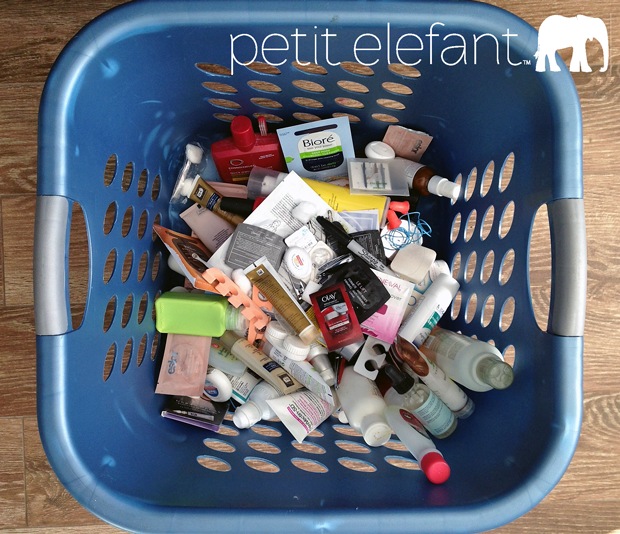 I don’t know about you, but *I* don’t need this many beauty products (and random magazine samples!) in my life. I’m not sure why, but sorting while I listen to an audiobook or watch a show somehow makes it easier, for me. Maybe I’m less emotionally invested in the project and am more inclined to toss things I don’t need, but whatever it is, it works. You do you and I’ll do me, and we’ll both win. As you’re sorting, put your stuff in piles: keep / donate / toss. Vacuum out the drawer or cupboard: dust, scrub, disinfect. 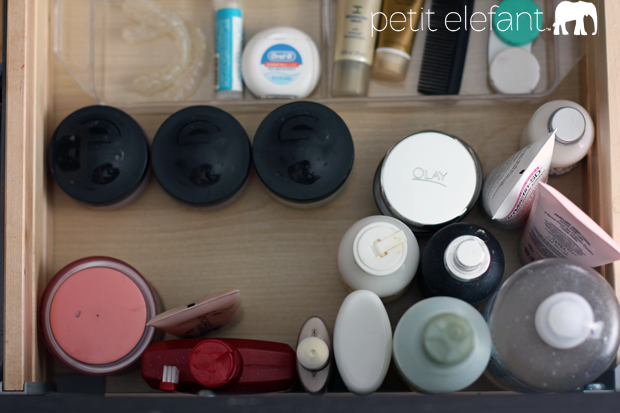 Make a nice and sparkling for the things you’re keeping. 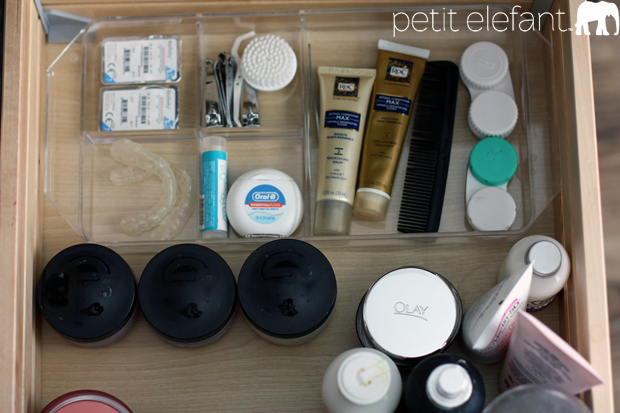 Organize your stuff in the drawer or cupboard in a way that makes sense to you. Maybe in the order you use your products in the morning and at night? By product category? You decide. Remember those piles you made when you were sorting? (see Step 2) Now’s the time to actually donate or toss. Be brutal. Remember my organizing motto: what would you pay to ship across the world if you were moving next week? My guess is not a lot. Va-va-VOOMzies. Look at you, fancypants, all organized like that. I feel better just thinking about all the cleaned out drawers, all that stuff you’re not using off to new homes and better uses. Now give yourself a high-five because you just rocked this challenge. Next week? 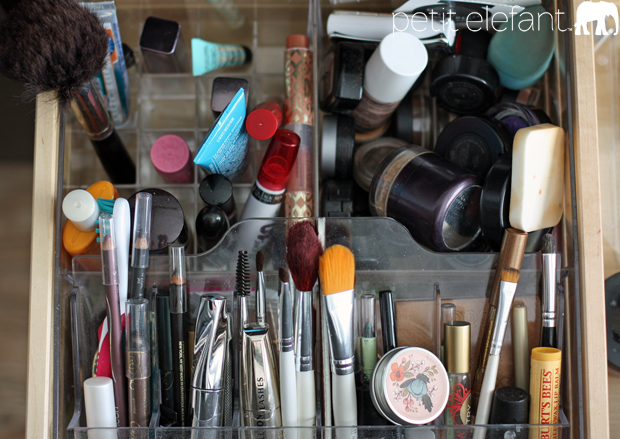 Wahoo, the makeup drawer side of the vanity! I can’t wait to get it all shiny new and organized. OK, I am a month behind and it will take me an entire month so April is dedicated to my bathroom. My super tiny, 5X8 bathroom. The ONLY bathroom in my house. I have a 3 shelf medicine cabinet, plus another similar unit over the commode, PLUS the under sink cabinet that has super packed drawers. One set of drawers per week.. I can DO this!! P.S. I re-purged my kitchen again in early February and have re-organized stuff twice. It still isn’t super ideal but I am getting there! This is fun!